I am so proud of my sister Malu and my niece Clarissa. Just a few weeks after it’s release, my sister’s book “Embracing God’s Purpose for My Special Child has been featured by the newspapers, magazines, radio and more. My sister took many years to finish this book and it’s one book that every parent should read whether or not they have a special child. Below is a description of her book. There is a chapter in the book about the financial challenges of raising a special child. 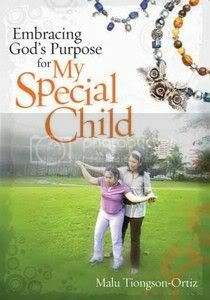 Author Malu Tiongson Ortiz shares her journey as mother to her Down syndrome child Clarissa. Malu talks openly about her fears and difficulties, and helps others learn from her experience. The book is enriched with testimonies from other parents of special children, plus useful resources and practical advice. Malu’s hope is infectious. Be inspired by her firm belief that God has a special plan not just for Clarissa, but also for those whose life she touches. I believe that God did not give me the special task of mothering Clarissa just so that I should teach her her letters and numbers. He did not design her to learn the ways of the world. God designed our special child to be an instrument to teach us to focus on heavenly things. Our church (word for the world Christian Fellowship) wants to invite Ms.Malu to share her personal testimony as a mom. How can we get in touch with her? Thank you.